Growing up at the time of the assassination of Malcolm X and Martin Luther King, Freddie judged by feel, not by colour. Blind to prejudice and discrimination, he formed dynamic connections with people and events, but only years later during his racing afterlife could Freddie come to understand the true power of the things he learned. Spencer is an articulate and compassionate guide as he describes the thrill and horror of racing in an era when death was a perennial threat. He recalls in pin-sharp detail the frenetic high-octane racing duels with the `King' Kenny Roberts, but also describes a parallel internal journey as he struggled to make sense of it all. Driven by a search for the personal fulfilment that comes through finding your purpose, Freddie's story is a universal one. In its message of hope, Feel transcends its genre to offer a story for everyone. Part thriller, part philosophical self-exploration, it is a remarkably insightful account of what it is like to have it all, but wonder why. "For the first time I will talk about the traumas of my childhood, the contrast between the leaf fire burns, the mistrust and discomfort and the peace and purpose I felt when riding my bike. I didn't tell my parents about something that happened to me. Why? I felt ashamed, but when I rode I felt connected to everything and the pain in my hand and heart would go away. It gave me the feeling of hope". 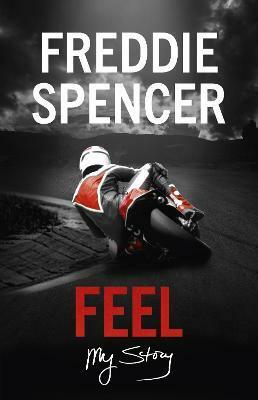 "It's bloody brilliant ... one of the most interesting autobiographies we've read"
Freddie Spencer will go down in history as one of the greatest American motorcycle road racers of all time. In addition to winning three World Championships, he is the only rider ever to win both the 250cc and 500cc/MotoGP Grand Prix World Championships in the same season (1985); the only rider to win three major races during Bike Week at Daytona International Speedway; and the youngest rider to win the 500cc/MotoGP GrandPrix World Championship, until Marc Marquez broke his record 30 years later. Spencer was born 20 December 1961 in Shreveport, Louisiana, and soon became a racing prodigy, learning to ride at the age of four and entering his first races at five. By the time he was eleven, Spencer had already won numerous state and regional dirt track racing championships in Texas and Louisiana. As a teen, Spencer began concentrating on road racing and continued winning by earning national amateur and professional road racing championships. Spencer retired from full-time GP racing in 1988, but made a couple of comebacks in the next few years. He went on to win three more US Superbike nationals, including his memorable final AMA national victory on a rain-soaked Laguna Seca Raceway in 1995, and officially retired later that year. After his racing career was over, Spencer founded a successful motorcycle riding school and businesses in Las Vegas in 1997. He also served as an expert analyst for the SpeedChannel TV network for 12 years to cover motorcycle races until 2008. Then both his professional and personal lives changed dramatically as he began the personal journey of philosophical self-exploration, travelling the world and sharing his experiences with others. Now he can share the story he was always supposed to tell.